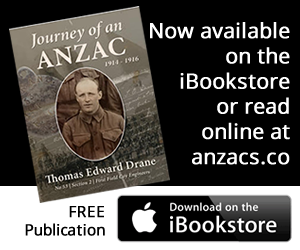 Extracts from the personal war diary of T. E. Drane from Forbes, NSW, written during WWI between August 1914 and April 1916. We are just sailing now away towards the heads, at last we are on our way to some unknown destination, what is in store of us we don’t know, but we are happy now. The boys are all up the rigging, or the washhouses, in fact every-where so that they could get a last look at Sydney. Just as we reached South Head some band was giving us a farewell tune just to cheer us up. Then we struck the entrance to the sea, between the Heads, and it was a little rough, and it was very funny to see the boys coming down the rigging, off the washhouses like a lot of sick rats. It was the first time some of them had ever left Sydney Heads, and they were sick, no mistake. Now I am going to have my tea, then find out the cosy little places on this ship. By the way we Engineers are right up forward along with the Army Service Corps, the 1st Battalion Infantry is down aft. You see I am getting quite a seafaring man now. We got leave from camp from 1 o’clock until ten at night, but I might say that we have no intentions being back by that time, oh no, we want to explore this great eastern city we have heard so much about at one time or another. We left Camp at 1.30pm, and we had to walk along Cambeis Rd to the tram. We had quite a time trying to get on for they were simply rushed by the boys. We gave the tram up for they were even on the very top of it, so we hired a carriage in pair, four of us. Four other fellows from one of the Battalions were in another one, and I may say there is no speed limit in Cairo. I had a very funny experience, in our duty we had to allow no motors or anything on wheels into camp office last post. I was pacing my post deep in thought wondering what my people were doing and the friends I had left behind (for that is the time you think when everything is quite) when I heard a carriage coming along. I was alert in a second, and when it arrived I called on it to halt. I heard the man inside tell the driver to drive on, so I told him the second time to halt; or take the consequences for I would fire and call out the guard. He stopped, and out walked our Colonel, I did not know what to do, but before I had time to speak he asked me what I meant by stopping him. Now I had a slight grudge against him for giving us extra fatigues one day. So I told my duty was to stop every carriage or motor, and make the people walk, and he would have to walk up the lines. He said he had his bag to carry up would I carry it for him. Now I nearly fell in over that, but I just remembered it would be leaving my post and would rank as desertion so I said no, so he had to carry it up himself, saying he would see about it in the morning! I thought that I was in for trouble, but I did not care, for I had the pleasure of seeing him carry up his own bag. I laughed to myself because I was top dog for once.